Striving to Find a Window Blinds Company in Celebration? Living in Celebration, FL you’ll definitely have something to celebrate about. We’re talking about your new exterior shutters and indoor shades. American Blinds and Shutters Outlet delivers the highest quality window treatments for the home or even your commercial needs. You’ll love new drapes. Our custom drapery & curtains are each made with a little TLC and enough spice to pizzazz the entire home. 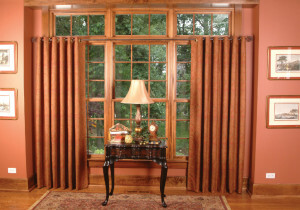 If you’re looking for a way to create more excitement in the home, then go with custom drapery. Custom design will make your home more unique as it’s built for you only. No one else will possess the same design. Our designers have been creating magical pieces for homes for the past 18 years and want to create a pattern just for you. For a Celebration shutter company that does all that and more, go with American Blinds and Shutters Outlet. We’re talented and experienced enough to deliver quality and not quantity. We don’t skimp on our work as we guarantee that you’ll love each piece. Call 407-492-1009 or complete our online request form to schedule a free consultation and see our full selection of window blinds in Celebration, FL.